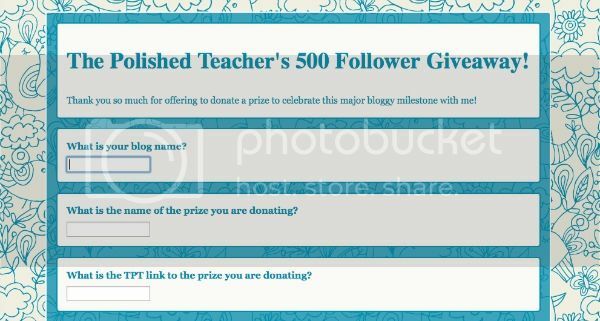 The Polished Teacher: Major Bloggy Milestone - 500 Followers! I was absolutely delighted to discover that The Polished Teacher hit 500 followers last night! It was the perfect way to end a stressful day! I cannot thank you all enough for the support that I have received in this blogging community! It means the world to me! As always, with big milestones comes big celebrations! I always like to give all my followers a chance to partake in the blog celebration that I host for these milestones. There might be a new blogger that I am not familiar with that would love to donate so I always open it up to everyone! This time around, I have gotten more tech savvy and did a Google Form for the process! If you would like to donate a prize to the giveaway, you can easily do so! By clicking on the picture below, you will be taken to a short form to fill out. This will answer all the essential questions regarding the donation. I will then send you a follow up e-mail to confirm. Thanks so much in advance for your generosity! I truly appreciate it! See you soon with some fantastic prizes to win! Congrats on reaching 500! That's wonderful! :) Here's to 500 more followers! Congrats on 500! I think I was pretty close to being your 500th follower. Congratulations! I filled out the form. Happy to help.